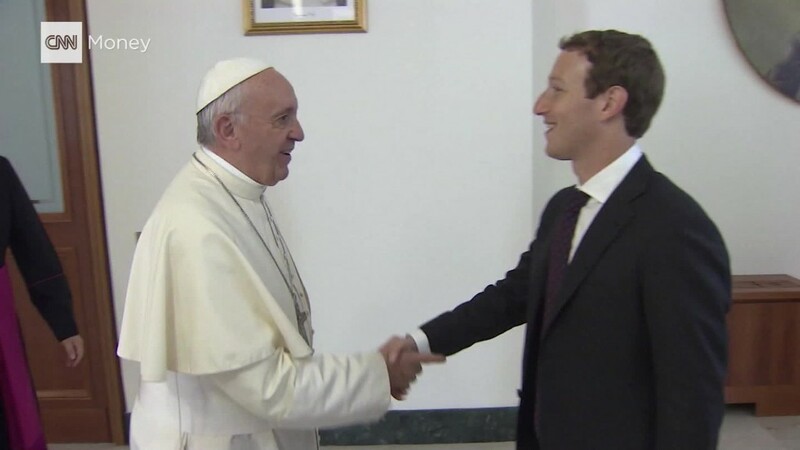 What do you give the Pope if you're a tech CEO? 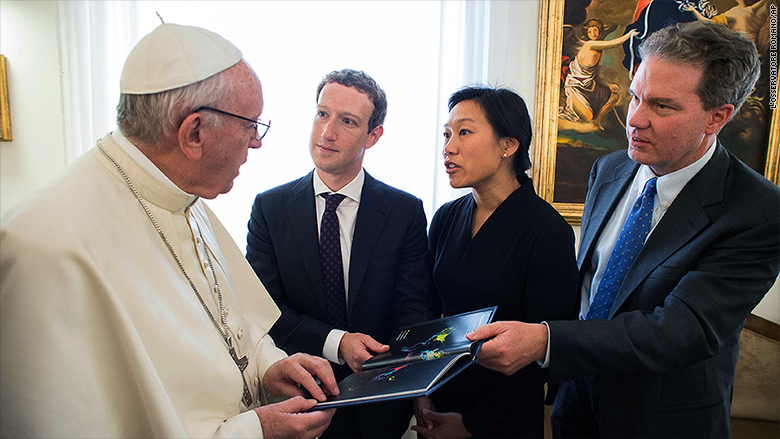 Mark Zuckerberg handed over a Facebook drone when he, and his wife Priscilla Chan, met Pope Francis on Monday. "It was a meeting we'll never forget," Zuckerberg said. "You can feel [the Pope's] warmth and kindness, and how deeply he cares about helping people." 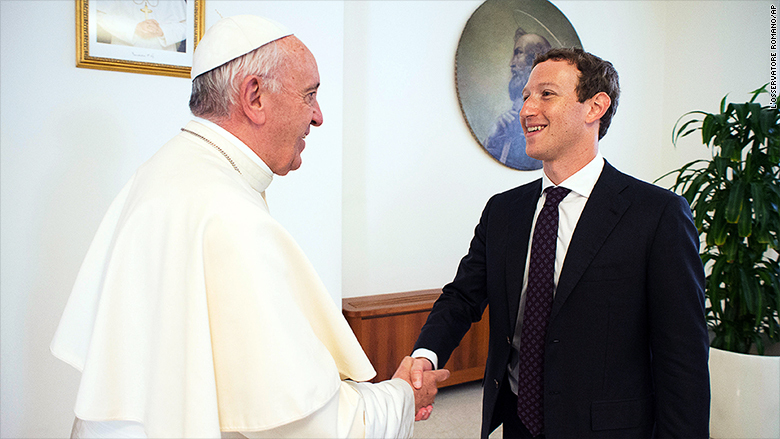 Zuckerberg updated his personal page on Facebook (FB) with a photo of himself giving the Pope a model of Aquila, a solar-powered aircraft that Facebook hopes will expand Internet access in developing countries. "Together they spoke about how to use communications technology to alleviate poverty, encourage a culture of encounter, and to communicate a message of hope, especially to the most disadvantaged," the Vatican Press Office said in a statement. Zuckerberg announced his trip to Italy last week after the country was struck by a devastating earthquake. He has scheduled a live question and answer session for later on Monday, and said he was "looking forward to spending time with our Italian community." The tech CEO has said Rome is a special city to him. He honeymooned there with Chan, and says he is a student of Latin and Classical history. Zuckerberg also posted a photo of himself running by the Colosseum. "It's great to be back in Rome! We started the day with a run past the Circus Maximus and House of Augustus up to the Colosseum. It's pretty amazing to run on roads in the city that helped invent them," he said. Over the weekend, Zuckerberg posted an update and photo from the wedding of Spotify co-founder Daniel Ek, which was held near Lake Como in northern Italy. Usually the act of a politician, visiting a country after a disaster would fit with Zuckerberg's recent push to paint himself as a sort of Silicon Valley statesman. He has been carefully crafting his image through Facebook posts, Q&As and public trips to places like China. The social network has also taken on an unexpected role in international disasters. After events like earthquakes, hurricanes, or bombings, people let friends and family know they're OK with Facebook's Safety Check feature. -- Livia Borghese and Heather Kelly contributed reporting.